Once the bitterness and emotional wrangling of the initial separation is over, separated parents can become very competitive. When warring ex-spouses try to out-do each other through increasingly expensive Christmas and birthday presents, holidays, days out and even items of clothing, there is more damage done than just the large hole in your pocket. Money can be tight after your divorce. That’s why it’s better to focus on what is important – your child’s happiness and your own – rather than trying to compensate for the fact that you no longer have Christmas Together as a Family, or you are Missing Important Milestones like your child’s birthday. Instead, find inexpensive ways to enjoy the occasion with your child. Simple pleasures like watching films together, feeding ducks in the park, a walk in a forest with a hot chocolate when you come home, or other high-quality, low-cost activities. You are undoubtedly going to feel sad and perhaps guilty about the effect of your divorce on your child, but don’t try to paint over the cracks with presents you can’t really afford. It doesn’t do anyone any good! If the resident parent, for example, spends a lot on presents for the child, it may be assumed by the non-resident parent that this money could have been more wisely spent, or that the Money Intended For The Maintenance Of The Child Is Being Misused. Ostentatious gifts are nearly always warning signs, and increase suspicion between ex-spouses as they wonder how the other person is able to afford such extravagance. This can lead to increased distrust and resentment, which is hardly productive in what is already a difficult and potentially acrimonious situation. Although this might seem obvious, it makes sense before you buy your child a present to check that your ex isn’t buying the same thing! Also, if you are contemplating buying something expensive, spare a thought for what this may do to your child. 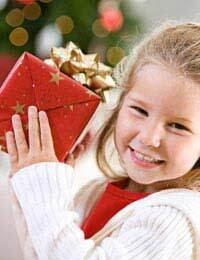 Some children are alive to the fact that an expensive gift may upset or anger the other parent, and it is not unheard of for a child to try to hide the gift in order to avoid this. While it is natural for people to be competitive, against their peers, their colleagues, their friends, neighbours and their ex-partners, the worst thing you can do is embroil your child in the negative emotions that you feel about your ex. Expensive gifts can also be seen as an attempt to ‘buy’ your child’s affection. In most cases, this isn’t necessarily what the child thinks, but is the perception of the other parent. Whatever the occasion for the gift, you should be focusing on your child’s happiness rather than using the day to ‘get back at’ your ex. If you’re buying for Christmas, support your child if they want to buy gifts for your ex-partner and his or her family. On the day, speak only positively about your ex (or if this is impossible, say nothing at all). This is perhaps the best gift of all that you can give your child! Your annual salary is calculated when working out how much child maintenance you should pay. The amount of annual leave your receive is deemed not relevant. Can my ex take a xmas gift off my son who is 16 nearly 17? Thanks for this. My ex always tried to buy my kids the most expensive presents, who are 14 and 12 but it shows me up because I don't have the money, then they think he's great, is there anything i can do? If it’s possible, consult with your ex on suitable gifts. Find out what the child is receiving from other family members. If they’re older and want something big, consider going in and splitting the expense with your ex. That way neither of you will be broke and the child we be especially glad to receive a present that’s from you both, a reminder that even after divorce you parent together.